18 cm. by 12.2 cm. Barnaby Rudge is an historical novel, and, as the second title indicates, a story of the Protestant riots of l780. We believe it to be most accurate as regards its historical setting; indeed, evidence exists to prove this. But Dickens created some of his best characters in those who are not historical figures, and their personalities brighten what might otherwise have been a sordid picture. Barnaby and, his raven, the Vardens, the Willets, Miggs — all are of the Dickens mould; and the scene when Joe Willet bids Dolly good-bye, which Mr. Copping has illustrated, serves as a typical instance of the power and artistry which pervades the book. 'Is this all you say!' cried Joe. Only after Joe has said a reluctant farewell to an undemonstrative Dolly does the reader become aware of the presence of Sim Tappertit, varden's self-centred apprentice, who in Phiz's plate seems delighted with the discomfiture and departure of his chief rival (upper left, behind the chimney in the Phiz plate). 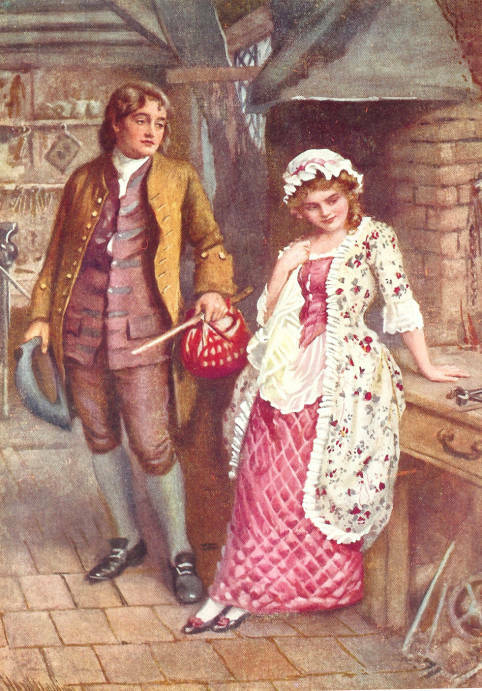 The focus in Copping's plate is thus not the irony of the situation nor the scene's place in the narrative-pictorial sequence, but rather the tender anguish, stoically disguised, of the handsome Joe Willet, the coquettish beauty of Dolly, both dressed very much in the upper-middle class fashions of the late eighteenth century. The viewer is reminded of the scene's labouring context by the vice (upper left) and the forge's hood, immediately above Dolly's elegant headgear, paid for by her father's trade. Later, rescued by Joe from the Gordon rioters along with Mr. Haredale and his daughter, she marries Joe, who has lost an arm in defence of his country. The young husband and wife restore the ransacked inn to its former convivial state. Matz, B. W., and Kate Perugini; illustrated by Harold Copping. Character Sketches from Dickens. London: Raphael Tuck, 1924. Copy in the Paterson Library, Lakehead University.